My popular blog post on CPU, GPU and MIC Hardware Characteristics over Time has just received a major update, taking INTEL's Knights Landing and NVIDIA's Pascal architecture into account. Moreover, I added a comparison of FLOPs per clock cycle, which I want to discuss in slightly greater depth in this blog post. The number of FLOPs per clock cycle (unity for a purely sequential CPU) is in the tens for CPUs and in the hundreds for GPUs and Xeon Phi. Only parallelization and vectorization can leverage the full potential. For comparison: A single-core CPU with no vector units is able to provide only one (two in the case of fused multiply-add) FLOP per cycle. Thus, if you write sequential code with poor data layout and no vectorization opportunities, you only leverage a few percent of your compute resources - even on CPUs. 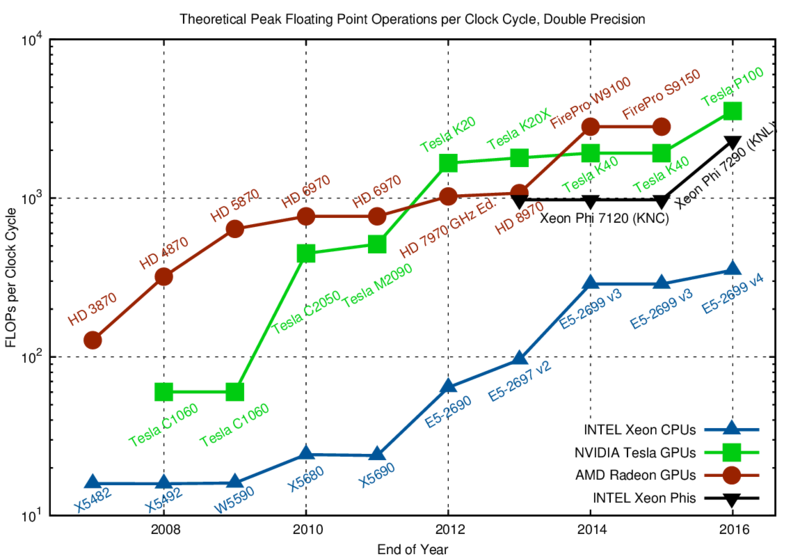 Comparing the data for GPUs and CPUs one finds that CPUs today offer as many FLOPs per cycle as GPUs in 2009 - but CPUs today have far higher clock speeds than GPUs in 2009. 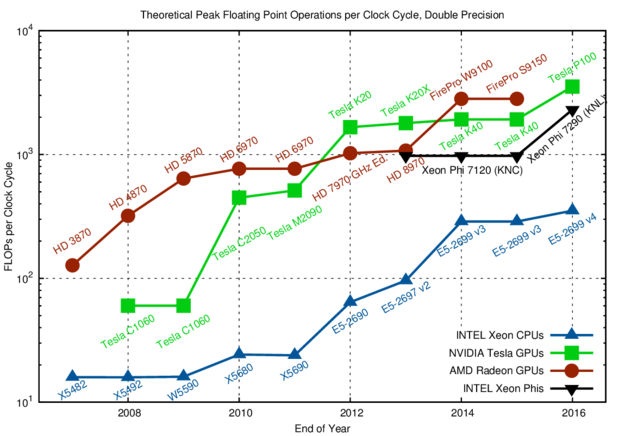 The upcoming Skylake Xeon CPUs are likely to increase the FLOPs per cycle by another factor of two. This will not only make Xeon CPUs even more similar to Xeon Phis, but will also reduce the gap to GPUs further. This blog post is for calendar week 16 of my weekly blogging series for 2016.